Since transforming our deck a few months ago I have been enjoying the seating area under the pergola and now that it has finally cooled down a bit we can dine alfresco on the other side. Today I'm sharing how I put together a table for two......fall style. 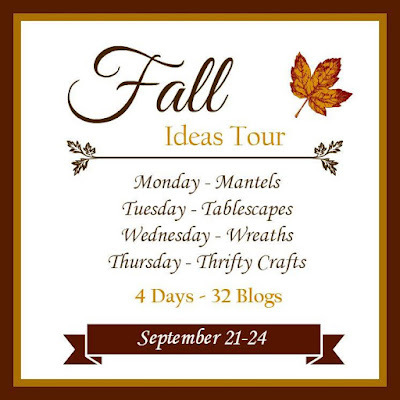 I am joining a fall tour today and the links will be at the end of the post for more table ideas. I had almost everything on hand except for the plaid tablecloth and napkins that I found at HomeGoods. I hung this sign I have had for years. I figured it works since this is outside and I have several potted mums sitting about. The round table is a bamboo fold up table that we can just bring out when needed and easily put away. I draped a vintage quilt across it with the back side showing. The other side is blue squares. Then I added the plaid tablecloth. I filled this very old Pottery Barn vase with fall colored faux flowers. I forgot this pillow is also new found at the Pottery Barn outlet last week. I have had Mr. Owl. I like to bring out owls and squirrels for the fall. The table set for soup or chili on a cool evening. I believe I found these plates at HomeGoods several years ago when I was hosting Thanksgiving. The napkins were purchased at the same time as the plaid tablecloth. I love how the two patterns work together with the same colors. They were not sold together. A ceramic squirrel and one of my plush pumpkins add some fall whimsy. This is just a fun casual dinner. Nothing formal or fussy. As the sun goes down a candle in an old mason jar filled with acorns and tiny pine cones will help out. As it gets darker it's time to turn the cafe lights on and it has been getting quite chilly at night so I have some throws in a basket to grab if we want to sit out a bit longer. You might have noticed my hanging shutters have been removed. The top shutter was coming apart and Mr. Savvy may try to repair it. If it can't be repaired I may try something else there. Ideas are spinning. Be sure to find much more inspiration at the links below. If you missed yesterday's posts you can catch up at all the links and be sure to return each day through Thursday. Very fall festive and cozy Kim, Love your owl pillow! We can see why you like to spend so much time out here. Your beautiful deck and lovely Fall tablescape are so inviting. Is it bad to say that we want Mr. Owl? We love your play with textiles, patterns and color...just lovely! What a beautiful space to enjoy a meal. Your deck is the perfect entertaining area and the pergola area is beautiful! Love it all Kim! Such a sweet spot, Kim! Love the whimsy in the animals and the textures that abound. Well done and thank you for the inspiration! 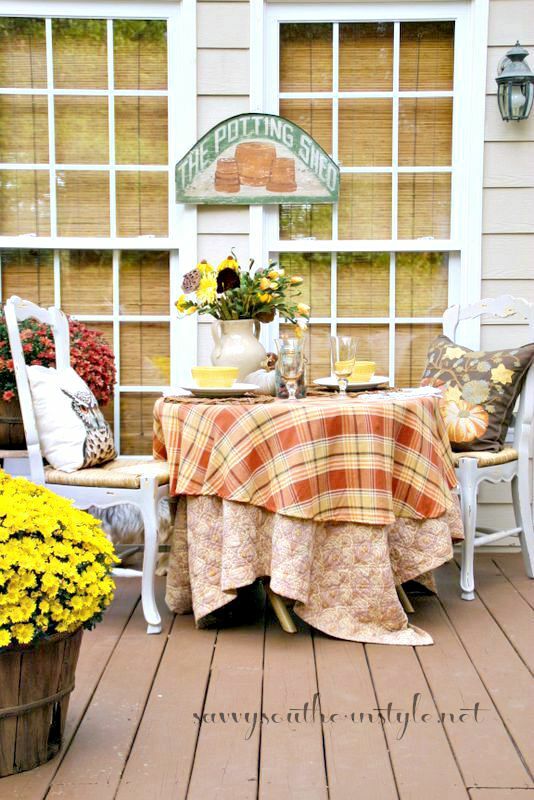 There's just something about dining outdoors that feels special, especially in the Fall! Your space is beautiful decorated in those gorgeous Autumn colors! Gorgeous space Kim! I love the mix of patterns and textures and that pergola is just perfect! I love dining al fresco and you have created the perfect spot for it! Enjoy your fall evenings! It's the perfect setting for a fall al fresco dinner! I love all of it...the quilt, pillows, vintage silver, just all of it. I know you'll enjoy the deck this fall. Those two pillows are great! What a beautiful spot to sit and talk with friends of relax with a book. Love it. So warm and inviting. Love the mixture of pillows, and the old quilt on the table! Beautifully done! This is lovely Kim! When I lived in Idaho, we did not have a Home Goods anywhere near us. The closest one was several hundred miles away. Now that we have moved back to Texas, I visit Home Goods each time I go to Houston for a major shop. I am hooked! I have found wonderful items there, especially linens. Your plaid cloth is so warm and friendly for a Fall tablescape. Love it! I'm usually a fan of neutral decor and table settings but this! This turned out so beautiful! It's not one of those table settings where you are afraid to touch anything. Your table setting is incredibly cozy! I love your pillows and that adorable ceramic squirrel incorporated into your Fall Tablescape Kim. What a clever idea using a vintage quilt over a table and it works beautifully with the plaid tablecloth. Very inviting alfresco table! Everything looks so cozy and inviting for a fall meal outside. The warm colours in your plaid tablecloth just say "fall". How nice to be able to go over to your seating area after dinner and enjoy its ambiance too. You must be loving this "fixed up" area of your home now. Your table is adorable...looks like you are really enjoying your newly updated deck. I was wondering if you would share where you found your cafe lights. I have searched with no success! Thanks bunches! Happy Fall! I love both pillows. The table looks fabulous! Love the acorn plates too!!!! I LOVE eating outdoors in the Fall too. Lovely, Kim! I'm sure you will enjoy dining out on the deck on these cool fall evenings! So pretty and cozy! Where did you find the woven handled chargers? So inviting Kim! I love the mason jar filled with acorns and a candle. What a neat idea! And Mr. Owl and the squirrel are a nice touch. I love the other side of your deck too! It all looks perfect for those crisp, Fall evenings. Very pretty Kim so glad you are enjoying your new deck. Everything is absolutely beautiful and perfectly fall-tastic Kim!! You are so amazing at putting things together to look like they have been collected over time. I just love all you do. You truly are gifted. Thank you for sharing your home and ideas. Awe, thanks Elizabeth. Most all of this stuff has been collected over time. Only thing new was one pillow and the plaid tablecloth. All the rest I have had for some time. Oh my! It all comes together so Well! Fabrics, colors, decor, and the sign and quilt! What a beautiful outdoor space you have! I'd love to enjoy a Saturday brunch on your deck. So beautiful Kim! I adore eating outside this ti,e of the year. Your table is so welcoming and I love your seating area under the pergola. Just stunning. Enjoy!! I love your table Kim and I covet your Potting Shed sign :) Your owl pillow is adorable and I have the PB pumpkin pillow which I love. I wish I was closer to an outlet. I love how you styled the table, the layers work so well together! Cozy and interesting, love the sign too! Kim, I know you love being able to use your deck again! I'll have to say that you are as gifted at combining table linens as you are bed linens. Everything blends together without being matchy-matchy! I might have to head to Pottery Barn to scoop those pillows! Every detail is perfect. Your space looks fantastic! Beautiful, Kim! I know that you are enjoying using your deck now that it's a bit cooler. Your tablescape looks so pretty. I very slowly enjoyed every detail as I scrolled through your post. I'm enamoured with your outdoor space, Kim. This really is inspiring me to get our new outdoor room decorated! I just need to find furniture for it! Love your new PB pillow. Wish we had their outlet nearby. You have inspired me to serve dinner on our deck these next two weeks while our weather here in Ohio is pleasant. Your pergola will be my inspiration to add to our deck next spring. I just want to sit down with a cup of chai tea and look at all your pretty stuff. So beautiful! Very beautiful, Autum~ish, warm and inviting! Thanks so much for sharing! I absolutely love this, Kim - so inviting! And it's me your inviting, isn't it? ;) Thank you so much for linking up at Best of the Weekend! I'm going to feature this tonight!